A County Down farmer has won a bursary to study an MSc in Agri-food Business Development at the University of Ulster. Thomas Steele from Kircubbin recently won the Dairy Council for Northern Ireland’s ‘Farm Smart’ bursary in collaboration with the University’s Ulster Business School. A partner in his family’s dairy farm, Thomas is hoping that further study will help him to advance his skills and encourage his business to continue to grow. 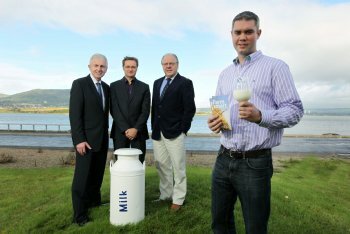 Chief Executive of the Dairy Council for Northern Ireland, Dr Mike Johnston, added: “We introduced this grant last year in order to encourage farmers to sign up and take advantage of the University of Ulster’s Agri-Food Business Development course. “If the Northern Ireland agri-food industry is to continue to grow, it is essential that we have the best people with highly developed business skills. Business acumen is an essential element of running a successful farm and this course will teach farmers how to maximise new and existing marketing opportunities, build local and international connections and develop entrepreneurial strategies to maximise profitability. For more information about the University of Ulster’s MSc Agri-food Business Development Course, please email Dr Geoff Simons at gj.simmons@ulster.ac.uk . Caption: Left to right - Michael Drayne, Chairman of the Diary Council for NI, Dr. Geoff Simmons (Ulster Business School), Dr. Mike Johnston (CEO Diary Council of NI) and Thomas Steele (Bursary Award winner).